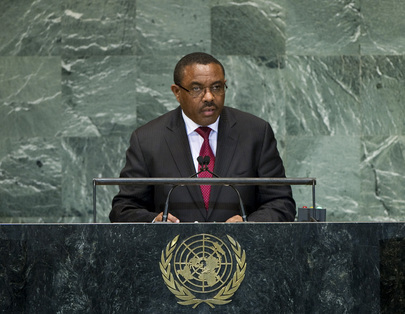 HAILEMARIAM DESALEGN, Prime Minister of Ethiopia, began by paying tribute to his predecessor, the late Meles Zenawi, whose death was a huge loss for his country and Africa. He and his party had facilitated the emergence of a “new Ethiopia”, which had rekindled the hope of Ethiopians in the future and strengthened their confidence in being able to overcome adversities. Indeed, there had been many “doomsday scenarios” bandied about regarding Ethiopia’s future, but its people had embraced their unity, and the country now enjoyed rapid economic growth of the kind it had never witnessed before in its modern history. The Growth and Transformation Plan was designed to catapult the nation “to that destination which has eluded our people for so long, but which is now within reach”. However, the country’s success hinged on a number of conditions being met, he cautioned, saying the first was the question of peace and stability and the challenge of extremism. While neighbouring Somalia was “gradually coming out of the woods”, much more remained to be done to ensure that its new Government stood on its own feet. “We would be naïve […] if we believed that the enemies of peace in Somalia and the region are completely defeated,” he warned. It was critical not to lose momentum and to strengthen Somalia’s ownership of the national reconciliation process. There had also been progress in the talks between Sudan and South Sudan, he said, describing what had been achieved over the last few days — culminating in the signing of a much-anticipated agreement on vital matters — was a significant breakthrough that must be consolidated and used as a basis for resolving outstanding issues. The second challenge to Ethiopia’s sustainable development agenda related to the “huge deficit” in international cooperation for the development of low-income and least developed countries, he said. That was spelled out in the Paris Declaration, the Accra Agenda for Action and the Busan Partnership for Effective Development Cooperation, he noted, adding, however, that “the resources have been few and far between”. Such challenges had been compounded by climate change, a global problem calling for responsible and wise leadership at the international level. That issue should rest on the principle of common but differentiated responsibilities, because countries such as Ethiopia — while not having contributed to climate change — were the most affected. Ethiopia would have hoped to see the Rio+20 Conference achieve more than it had, but nonetheless looked forward to meaningful and effective efforts on the part of the Working Group on Sustainable Development, to which Ethiopia was ready to contribute the best that it could.